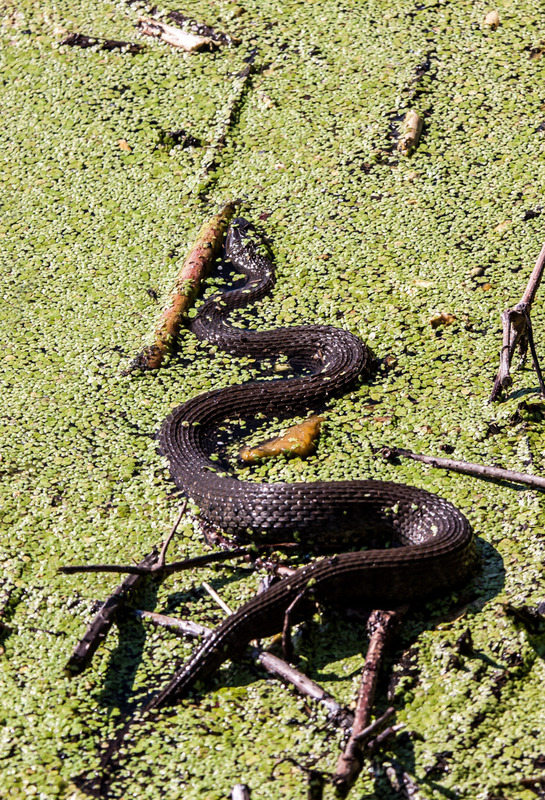 Semi-submerged in the duckweed in the shallow water, this snake patiently awaited an unseen prey yesterday at the pond at Ben Brenman Park, a small suburban park not far from where I live in Alexandria, Virginia. I did not get a really good look at the snake, which dove into the water shortly after I took this shot, but I think it might be a Northern Water Snake (Nerodia sipedon). In many ways I was more interested in the sinuous curves of the snake’s body than in the identification of the snake’s species. There is an abstract beauty in the colors and the shapes in this image that appeals to me, though I know that some of my viewers are so creeped out by the main subject that they will find it hard to see any beauty whatsoever in the image. Love the sinuous lines in this image. The curves remind me of a river with oxbows. Many patterns in nature are curiously similar. I’ve found that the more that I shoot with my camera, the more sensitive I become to repetitions of colors and patterns in nature. I truly believe that photography helps me to see the world differently. That is one big snake! I don’t want to see snakes up close but I do find them pretty to look at! I think this is the first time I’ve seen a snake picture on your blog. Very nice! Thanks, Robert. I’ve had a couple of postings with some pretty graphic shots of snakes swallowing fish, including this one from earlier this yearhttps://michaelqpowell.com/2018/07/22/snake-versus-fish/.